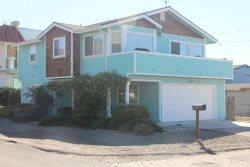 Beautiful Morro Bay Beach house getaway, is just across the street from Morro Strand State Beach and practically ocean front with sweeping views of the Pacific Ocean from the living room, kitchen, master bedroom and large 900+ sqft deck. This home has everything you could possibly want on your next vacation. Inside this 4 bedroom home you will find a large open living, dining and kitchen area with hardwood floors throughout the entire home. The open floor plan features a large bar with seating for five, a dining table with seating for six and ocean views of the Pacific Ocean from almost every window. Outside the living room you will find a large open deck protected with Plexiglas allow a calm environment to relax and enjoy the beautiful Morro Bay weather. On this deck you will also find a gas BBQ, outdoor dining table for 8+ and multiple lounge chairs. With 4 bedrooms this home will comfortable sleep 8 guest. In the first bedroom you will find a queen size bed with its own full bathroom. In the second bedroom you will find two twin beds connected to a Jack-n-Jill bath. On the other side of the Jack-n-Jill bath is the 3rd bedroom with a queen size bed. This room also has a sliding glass door opening to the large patio. In the rear of the home you will find a large master bedroom with a Cal King Bed, full master bath and spectacular ocean views across the deck. 110 Java, Morro Bay has many modern features and amenities to make your upcoming stay more pleasurable including: Wireless Internet, Cable TV, Dishwasher, Fully stocked kitchen, All linens and supplies included, washer and dryer, and much more. Contact Rock Star Properties today at 805-709-2204 to book your stay! Wireless Internet, Cable TV, Dishwasher, Fully stocked kitchen, All linens and supplies included, washer and dryer, and much more.